Assam: The health sector in the state of Assam is on the up as various developmental projects to improve healthcare have been ushered in the state. In yet another step towards development, BJP National President Amit Shah, along with industrialist Ratan Tata, recently laid the foundation stone of 19 cancer speciality centres across the state, which will boost the potential to drastically improve cancer care in the state and the northeast region as a whole. Technological advances in the healthcare sector have certainly curtailed down other infection-related diseases in India’s northeast region, but the burden of cancer is quite alarming in the region. The northeastern states have the highest incidence of cancer in the country due to various reasons including food habits and other related issues. However, the present government under the leadership of Prime Minister Narendra Modi is making vigorous efforts to uplift the healthcare sector of the region, in an endeavour to make northeast a medical tourism hub for the region. Keeping in mind the quality health services and to transform the scenario of cancer care in the state of Assam as well as in the region, BJP National President Amit Shah, along with industrialist Ratan Tata, in presence of chief ministers of Assam and Arunachal Pradesh recently laid the foundation stone of 19 cancer care centres all across the state in a special function held in Guwahati. The cancer centres would boost the potential to drastically improve cancer treatment in the state and the region as a whole. Thousands of people from all walks of life gathered to be a part of the momentous ceremony. “It is indeed a moment of joy for me as Assam witnessed the foundation laying ceremony of 19 cancer care centres including L1, L2 and L3. Cancer care treatment is divided into three-tier cancer grids which involves cancer identification, operation and post cooperative care. I believe such step was not undertaken before and it would definitely play a significant role to facilitate the growth of health care facilities in Assam which was not the scene before independence. This is a historic moment of Assam”, said Amit Shah, BJP National president. The Assam government and Tata Trusts have collaborated for a joint venture called Assam Cancer Care Foundation under which three-tier cancer grids would be established which will uplift the health care facilities of the state and the northeast region in particular. 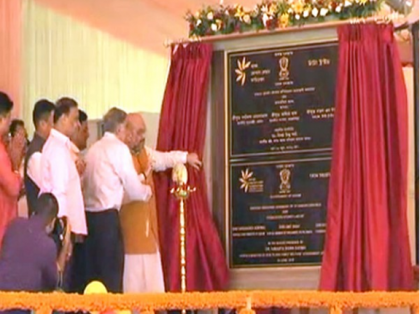 Industrialist Ratan Tata and Assam’s Health and Finance Minister, Dr Himanta Biswa Sharma launched the centre. “We are proud to announce that, to implement the health programme, the state government will need 2000 crore Rs and out of the total amount, Rs 900 crore will be sanctioned by the Tata Trusts. Under the leadership of Chief Minister and guidance of Prime Minister Narendra Modi, the promise of building a developed state of Assam is shaping into a reality and in context of this, the Assam Government is providing Rs 1030 crore for the fulfillment of the same”, said Dr. Himanta Biswa Sharma, Assam health and finance minister.